Der NH-L9 ist ein extrem kompakter, leiser Low-Profile Kühler, der für die Verwendung in kleinen Gehäusen und HTPC-Umgebungen entwickelt wurde. Der Kühler verfügt über eine in seiner Klasse hervorragende Kühlleistung, ist jedoch nicht für Overclocking geeignet und sollte auf Prozessoren mit mehr als 65W TDP (Thermal Design Power) nur mit Vorsicht eingesetzt werden. Bitte konsultieren Sie unsere CPU Kompatibilitätsliste und TDP-Richtlinien, um zu überprüfen, ob der NH-L9 für Ihre CPU geeignet ist. Der NH-L9i verfügt über eine 95x95mm große Grundfläche, die exakt in die Keep-Out Zone des Intel LGA115x Sockels passt. So kommt es zu keinen Problemen mit Chipsetkühlern und der Kühler hängt nicht über die RAM Slots, bietet also volle Kompatibilität zu hohen RAM Modulen. Bei den meisten Intel LGA115x basierten mini-ITX Mainboards sitzt der PCIe Slot direkt neben der 95x95mm Sockelzone. Während größere Kühler meist den PCIe Slot blockieren, bietet der 95x95mm große NH-L9i volle Kompatibilität mit PCIe Karten. Der hochoptimierte NF-A9x14 Premium-Lüfter unterstützt PWM für vollautomatische Geschwindigkeitsregelung und greift auf neuartige aerodynamische Konstruktionsmaßnahmen sowie Noctuas AAO-Rahmensystem zurück. So bleibt der NH-L9i bemerkenswert leise. Mit dem (L.N.A.) kann die Geschwindigkeit des NF-A9x14 Lüfters von 2500 auf 1800rpm reduziert werden. So lassen sich mit CPUs unter 65W TDP nahezu lautlose Systeme realisieren. Der NH-L9i wird mit einem maßgeschneiderten SecuFirm2™ Montagesystem für LGA115x ohne Backplate ausgeliefert, das bessere Kompatibilität mit mini-ITX Mainboards sowie eine noch einfachere Installation garantiert. Unverändert bleibt natürlich die bewährte SecuFirm2™ Qualität. Noctua Produkte sind für ihre makellose Qualität und herausragende Langlebigkeit bekannt und wie alle Noctua Lüfter verfügt auch der mitgelieferte NF-A9x14 über eine MTTF-Spezifikation von über 150.000 Stunden. Das gesamte Paket des NH-L9i wird mit vollen 6 Jahren Herstellergarantie ausgeliefert. At stock speeds and voltages on the Core i7 2600K processor, Noctua's low profile NH-L9i was able to deliver a solid 13+% improvement of 10C, over the 73C load temperature delivered by the Intel box cooling solution. On top of that, it shaved 4C off the load temperature delivered by the the other low profile cooler in this comparison, the Phanteks TC90LS. With only a 65W TDP load capacity, these temperatures are a solid improvement when run on a higher wattage CPU than it is rated for. The other low profile solutions in the comparison failed to keep the CPU temps in check, with my overclocked settings. 96C is in no way kept in check, but at least Noctuas design kept the load temperature under 100C. It's not recommended to run that close to the TJ Max temp, but it was able to stay under that limit without throttling. A cooling solution for the overclocking enthusiast, the NH-L9i is not. Although some mild overclocking with a low wattage TDP processor might open some doors for this low profile solution. As it is, the Noctua NH-L9i plays well above its fighting weight when cooling a 95w TDP chip. Keeping that in mind the NH-L9i was able to deliver a 13+% improvement over the stock Intel box cooling solution when paired with my Core i7 2600K and it even out performed a competing solution by 4C running in the same configuration. Impressive to say the least from a 92x92mm cooler that stands only 37mm tall. As a low profile design, the NH-L9i is going to fit into a chassis that larger cooling solutions just cannot fit into. Perfect for a small form factor gaming rig or HTPC where space is at a premium. The compact footprint means you will not run into some of the challenges seen with larger solutions, that include fitment problems when running DRAM modules with large heat shields or space concerns with video cards that just get to close to the cooler. AMD fans will need to look elsewhere, as this cooler is going to work only with Intel LGA socket 115X motherboards and processors. Even with the TDP limitations of the NH-L9i, I am really pleased with the results it delivered. Comparing it head to head against the Phanteks, while it may have been cheaper, it doesn't test as well, doesn't have the ability to take on other fans, and frankly, doesn't look as good. There is a more solid feel, and as I like to describe it, a more professional grade feel to the Noctua solution. The thickness of the aluminum used in the fins is always thicker than most others, and almost nobody solders on heat pipes these days. Noctua seems to bend all the average manufacturers rules as they offer products that take the competition head on and seem to almost always prevail. With the NH-L9i things haven't changed, this is a really impressive solution. What impresses me even more is the shear amount of air flow and static pressure Noctua was able to pull out of this 14mm thick 92mm fan. I know most of you looked at that fan and thought that it really can't do much, it's just too tiny - well, Noctua definitely went to work with this new addition to their fan lineup. There really isn't a surface that is left untouched. The leading edge of the frame is made to allow a smoother inlet of air to the blades, and the insides of the frame have divots like a golf ball to disturb the air and keep it from staling near the frame. The shape of the blades is one thing, but there are grooves cut into each of them, and even the textured finish to the individual blades has its benefits. If you aren't really strapped down for room above this cooler, you always have the option to add a 25mm thick fan with the supplied hardware, and grab back a few more degrees as well. Noctua may not have made a cooler that everyone is going to rush out and have to buy one to put in their PCs as soon as possible, but that really wasn't the idea in the first place. Taking the idea of bringing what I already love about Noctua, the silence, better quality, and being simple to use and install, and shrinking all of that love into this tiny little package, it's just amazing to me. Noctua didn't see any reason to lower their standards just because things need to be small and low-profile to fit in the SSF chassis side of PC builds; those customers deserve the best just the same as the people who can use a D-14. Par rapport au radiateur stock Intel, le gain est appréciable, même en utilisant le module LNA du bundle, qui passe le ventilateur à 1800rpm. Les nuisances sonores baissent aussi largement, et deviennent plus que supportables, alors qu'en 12V, ça souffle plutôt fort. Pourtant, pour un slim de 92mm, les nuisances restent contenues, on pouvait craindre pire. 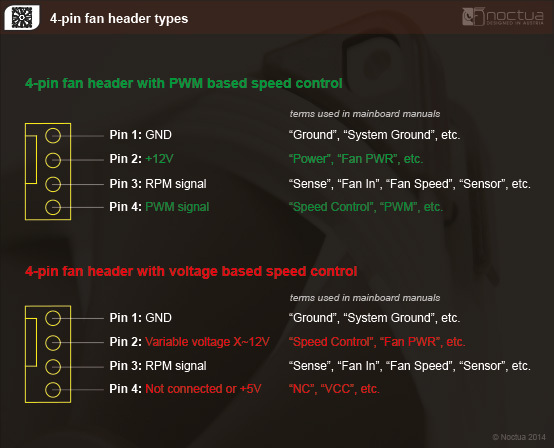 Avec un minimum de 300rpm sur la plage PWM, il est plus que conseillé de prendre un peu de temps pour configurer le PWM, afin de profiter d'un radiateur vraiment silencieux, surtout si le processeur a un TDP plus faible que notre 3570, fixé à 77W. Noctua NH-L9i is high quality and well performing compact cooler. As I mentioned at the beginning of this review, not many similar coolers are available on the market and for sure not many can offer so high product quality. Everything looks great including package. The star of the show was the Noctua NH-L9i, which just made a light noise at full load with its fan at full speed, but was inaudible above the rest of the hardware in our test system when using its fan-speed reduction cable. When we look at CPU coolers it normally comes down to the numbers, how well the cooler performs, but in the case of the Noctua NH-L9i we have to look at it a little bit differently. If you look at the results on the previous page they are nothing to write home about when compared to other coolers. But if you take into consideration the size of the NH-L9i, at only 37mm high and still able to keep our i7-3370K at a respectable temperature. That is pretty impressive. Even with the low noise adapter in use the temperatures were acceptable. The NH-L9i has excellent cooling performance for the form factor, acoustics that make it ideal for a totally silent HTPC or SFF system and a price tag that is reasonable given how unique and innovative the product is. The chances are, if you’ve gone to the effort to make a super compact LGA 1155 based HTPC or SFF system, then having to spend a paltry £33 (when all the other components probably cost hundreds) is actually remarkably little. Performance of the Noctua NH-L9 was outstanding for such a low profile cooler. Temperatures at stock speeds on the 3570K were more than acceptable, while the G840 ran incredibly cool. The fan remained inaudible to ~2000rpm, but was clearly discernible at full speed. It’s easy to look at just the benchmark numbers and arrive at some type of opinion about a cooler. After all, cooling is their main, and basically only function. However, in the case of specialized coolers like the NH-L9 there are many more factors to consider. In true Noctua fashion, the NH-L9 addresses these factors head on and with the greatest of results. The cooling end of the NH-L9 may not look like any great achievement at first glance, but that first glance is deceptive. The big reason being the size of the coolers being compared. While the NH-L9 comes in at only 37mm tall while the next smallest comes in at 45mm, and the other two will not fit in an HTPC case with 50mm clearance at all. The ZT-560D actually stands over twice as tall as the NH-L9. While the 45mm cooler will fit in the HTPC case, it will have very little breathing room for cool air intake, while the NH-L9 will be breathing freely. This is what makes these benchmark numbers for the NH-L9 incredibly impressive. Since CPUs like a Pentium G840 or Core i3 are commonly used in HTPCs, we decided to start our testing there. The NH-L9 handled the G840 with ease, never coming close to getting anywhere near thermal limits and making a huge improvement over an included stock cooler. Moving up to the Core i5 3570K, the NH-L9 maintained its composure and kept the 77 watt processor nice and cool at stock speeds without a problem. It is important to note that Noctua states directly that the NH-L9 is not to be used for overclocking, and the statement holds true. A small OC on the 3570K sent temperatures escalating, but this is not the intended purpose of the NH-L9. Though small, the NH-L9 has the fantastic build quality you would expect from a Noctua cooler. The two heat pipes are clearly visible through a very sturdy heavy gauge aluminum fin array, and there is not a sharp corner anywhere. The fan mounts simply and securely, and has excellent rigidity for a slim fan. Installation could not be simpler, and literally requires simply tightening four screws. 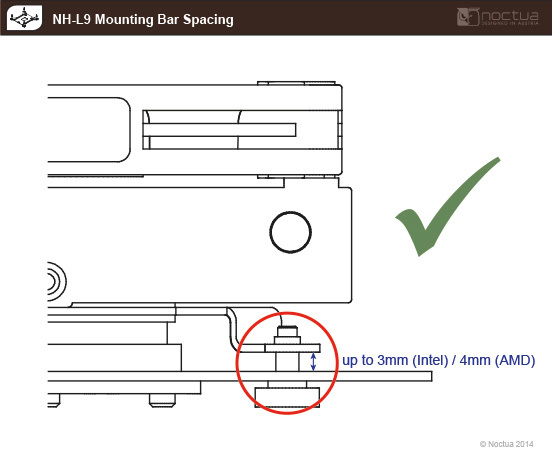 Mit dem NM-AM4-L9aL9i SecuFirm2™ Mounting-Kit können Noctua NH-L9a und NH-L9i CPU Kühler auf AMDs AM4 Sockel installiert werden. Ist der NH-L9i mit dem Gigabyte GA-H77N-WIFI und GA-Z77N-WIFI kompatibel? Kann der NH-L9i auf AM4 verwendet werden? Welche Noctua Kühler sind kompatibel zu LGA115x (LGA1150, LGA1151, LGA1155, LGA1156)? Ist der Kühler mit dem LGA1151 Sockel kompatibel? Ja, nach einer kleineren Revision ist der Kühler nun voll zu diesen Mainboards kompatibel. Der NH-L9i wurde für die Intel LGA115x Plattform entwickelt. Der Kühler kann mit dem NM-AM4-L9aL9i Kit auf den meisten AM4 Mainboards problemlos montiert werden, doch es besteht die Möglichkeit, dass er in manchen Fällen nicht passt. Bitte seien Sie daher besonders vorsichtig, wenn Sie den NH-L9i auf AM4 montieren und stellen Sie sicher, dass der Kühler nicht gegen andere Komponenten drückt. 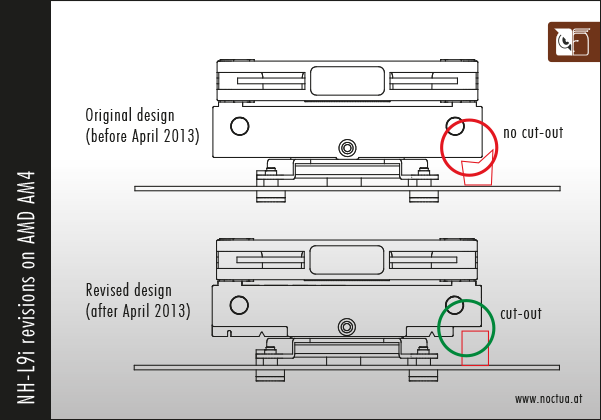 Bitte beachten Sie ferner, dass es im April 2013 eine kleinere Revision des NH-L9i Kühlers gab (siehe nachfolgende Illustration). Seit dieser Revision verfügt der Kühler an einer Seite über einen kleinen Ausschnitt, um mehr Freiraum für hohe Mainboard-Komponenten zu bieten. Wenn Sie den Kühler auf einem AM4 Mainboard mit hohen Komponenten in Sockelnähe montieren und Ihr Kühler über den Ausschnitt verfügt, können Sie diesen so orientieren, dass der Ausschnitt direkt über den Komponenten liegt, um eine bestmögliche Kompatibiltät zu erreichen. Prüfen Sie jedoch bitte unabhängig davon, ob Ihr Kühler über den Ausschnitt verfügt oder nicht, dass dieser nicht gegen andere Komponenten drückt! Aufgrund des geringen Gewichtes des Kühlers ist es nicht erforderlich, diesen für dem Transport des Systems abzunehmen. Die Montage erfolgt auf allen LGA115x Sockeln (LGA1150, LGA1151, LGA1155, LGA1156) identisch. Die folgenden Kühler sind daher ab Werk zu LGA115x kompatibel und können ohne weitere Upgrades auf dieser Plattform verwendet werden: NH-C12P SE14, NH-C14, NH-C14S, NH-D15, NH-D15S, NH-D14, NH-L12, NH-L12S, NH-L9i, NH-L9x65, NH-U14S, NH-U12S, NH-U12P SE2, NH-U9S, NH-UD9L, NH-U9B SE2. Weiters können alle älteren Kühler, die mit dem NM-I3 Kit nachgerüstet wurden auf LGA115x verwendet werden und bedürfen keiner weiterer Upgrades. Die folgenden Kühler können mittels des NM-i115x Upgrade-Kits zu LGA115x kompatibel gemacht werden: NH-C12P, NH-D15 SE-AM4, NH-L9x65 SE-AM4, NH-U12, NH-U12F, NH-U12P, NH-U12P SE1366, NH-U12S SE-AM4, NH-U9, NH-U9F, NH-U9B. Die folgenden Kühler sind mechanisch inkompatibel mit dem NM-i115x Upgrade-Kit und könne daher nicht zu LGA115x kompatibel gemacht werden: TR4-SP3 Kühler, DX-3647 Kühler, DO-Serie AMD Opteron Kühler, NH-L9a, NH-L9a-AM4. Ja. Da der Mechanismus zur Kühlerbefestigung auf LGA1151 ident zu LGA1150, LGA1155 und LGA1156 ist, unterstützt der Kühler auch LGA1151.